Forties connect allows you to narrow your dating pool to older singles in your desired area without including younger singles who aren’t looking for the same things you are in a relationship. The website is easy and fun to use, with a wide variety of ways to get to know likeminded singles, including dating diaries, inbox messaging and instant chat. Profile options are extensive, including photos and video functionality for a more accurate ‘first impression’. Fully mobile responsive so you can date on-the-go, what are you waiting for? Signing up to find singles on Forties Connect is a breeze. Simply enter your gender, date of birth and first name, and include a valid email address, and you’ll be taken directly to the profile screen. 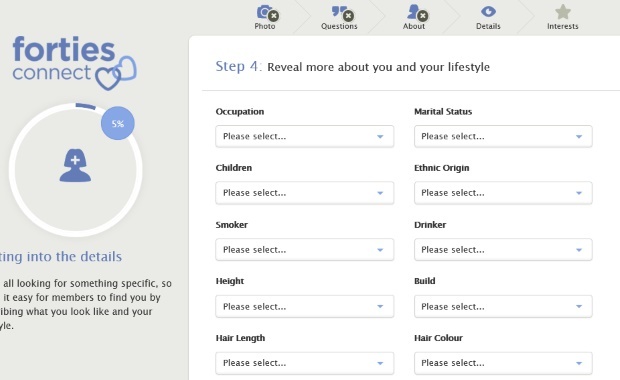 Here you can create a user profile which includes as little or as much as you want to disclose. Remember, the more you can tell people about you, the more likely you are to find suitable matches! Answer open ended questions about your interests, or fill in the details tab with a description of yourself and what you are looking for. Then use tick boxes to include interests and hobbies such as travel or sports, and add physical attributes such as build or hair colour. 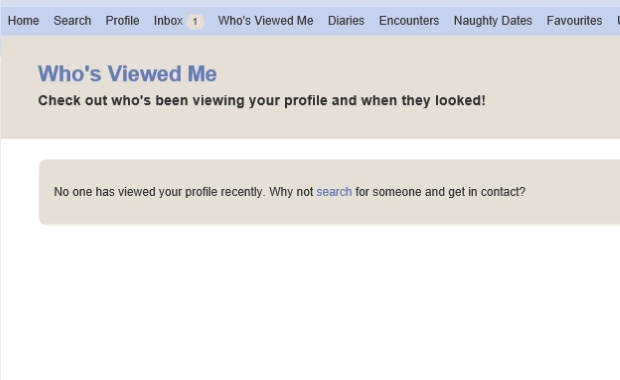 Once you have completed your profile, and added photos, you will then need to verify your email. Doing this will take you to the home page, where you can easily access all the areas of the website. Everything is easy to follow in clear tabs from the home screen, or drop down menus when you hover your mouse cursor. There are a number of interesting features on the Forties Connect website. Some of the best can be included as bolt on extras to any subscription package. Sending inbox messages can be a great way to get in touch with a potential match, but it can be frustrating waiting for a reply! Choose from great extras including read receipts to see when your message has been viewed, and unlock your account to be messaged to even when the other person does not have a paid for subscription. This way you can be sure that you will always get that response you’re looking for. Other features of the website include the functionality to see who has viewed your profile, allowing you to get a better idea of who the website is suggesting you to, and adapt your profile accordingly if it isn’t quite right. We also love the dating diary, an in-built blogging tool which lets you share your dating journey and much more. Of course, none of this matters if the search functionality is not up to scratch. Luckily, this is not a problem at Forties Connect. Search by profile, allowing you to find exactly what you’re looking for with as much detail as you could use when setting up your own account, and narrow down the hunt by location, age, photo, and even who is online right now. Once you have found what you are looking for, send an inbox message, a gift, a flirt, or even start chatting immediately if they are active with live chat. When you see the words Online Dating Protector, you know you can use the website with confidence. This third party company moderate and protect the website from suspicious behaviour and malicious users by scanning profiles and being on call 24/7 for you to report any problems or concerns you might have. Additionally, take a look at the dedicated safety tips page for lots of information about meeting people safely from online, as well as keeping yourself protected from identity theft and online scams. Forties Connect offer a 3-day trial for a bargain price of £4.99. Take advantage of this so that you can access all the features and functionality of the website completely risk free. Once you are ready to sign up for a longer term subscription, remember that the longer you sign up for, the cheaper your cost. The cheapest option is a year’s subscription, which is £12.50 per month. The most popular option is 6 months, for £15.00 per month, and you can also choose 3 or 1 month packages for £19.99 or £29.95 respectively. Whichever option you choose, be aware that the payment will be taken in one go, rather than monthly instalments. We love how Forties Connect allows for easy to use features and simple navigation for older singles, but does not compromise on innovative and unique functionality and fun. A great choice for singles aged 40+ to find new people online.